Spanish and Other Accents Fast and Easy! This site is brilliant. They created a little text area where you can produce accented characters for various foreign languages like Spanish with a simple click of an icon. No more searching in Word for a single symbol lost in an unorganized list of Symbols. Should adding accents really take you five minutes? NO. Please use this resource. Favorite the page with your browser to keep it nearby. 10 Steps Toward Tetris Victory! The popularity of the game Tetris is rediculous. Tetris looks simple upon first look, but there is an extreme amount of technique and complexity in the millions of games of Tetris Friends that occur each day. I have listed 10 definite ways to improve your tetris gaming. 1. Do not allow holes to form underneath pieces unless absolutely unavoidable. 2. Find a balance of speed and precision. The faster you place your tetrominos, the more mistakes you will make. 5. Practice with Tetris marathon to increase your selection speed. The marathon version of Tetris forces you to play with falling tetrominos that speed up over time. 6. Use the HOLD function. So important to use hold and swap, so you can place a long teal line right down the cavity you set up. 7. Set up attacks ahead of time. Plan ahead. You should be looking into your next move before your hand hits the drop key. 8. Play hard from beginning to end. Many people do not play with full energy until too late into the match. Do your best to drive hard from the start. 9. Challange yourself by playing players that are levels higher than you. For example, if I was level 20 on Facebook Tetris, I would try and play level 25's. Sounds extreme, but you will improve and know what is soon coming. 10. Keep an eye on your opponents maps. If you can spot flaws in their placement or potential lines that will soon be sent, you should adjust accordingly. Best use of this is in 2-Player by far. But, with practice 6-Player is manageable. Quickly test your logical skills in this little teaser! The lesson follows it. Decimal is a word familiar to us all. You most likely think of a decimal point, but decimal better applies to a number system based in 10. The ten numbers are 0, 1, 2, 3, 4, 5, 6, 7, 8, 9. The reason 10 is not included is because we use zero to represent a multiple of ten, when following a coefficient or real number. 101 in binary is 5 in decimal. What about if you are 64 years old in decimal? Supposing you are; You would be 1000000 years old in (binary). This is because the only 1 that is in the far left is in the 7th place to the right which results in a value of 64 (decimal). More Questions! The answer is in white print (invisible hopefully). Q1. If you were 10001 years old, how old would you be? Q2. If you were 11111, could you drive a car in the United States? Answer: Yes. You would be 1+2+4+8+16 = 31 years old. 1110 = (1*(10^4) + 1*(10^3) + 1*(10^2) + 0*(10^1) = 8 + 4 + 2 + 0 = 14. Binary is essential for computers, including our super computer brains. There are no maybe's in binary; however, there are negative numbers if you are limited to a specific number of digits. Like a byte (8 binary digits): 1000 0000 = -0 because the highest digit in the byte determines whether the number is positive or negative. If your Youtube video is going slow, or stalling it could be because your connection to the internet is too slow, or your computer is completing too many tasks at once, but wouldn't be cool to see where your speed stands next to the rest of the country? It's amazing what sites can do with cookies (pieces of text on a browsing computer that are used to recognize the visitor). Youtube allows you to view the stats what they call a "YouTube Video Speed Test." All you do is [Right Click] the video and select "Take Speedtest." Make your HD videos small enough to upload to YouTube in seconds! I guess you could call it a box code instead a bar code. They were originally being used in the automotive industry, but have grown in popularity, so much so, that it would not be far fetched to think it may be a new standard for labeling merchandise and items. Do you sense the trend? 4. Keep Quality around it's default (appr. 75), but change Framerate to around 26. Does Water Conduct Electricity? The Answer Would Surprise You! Pure H20 or water does not conduct electricity. I know that may seem ridiculous, but it is true. However; well water, tap water, pond water do conduct electricity and will short out any of your electronic devices. I'm sure that makes a little more sense. Right? It is clear electricity travels well through metal objects like: copper; tin; lead; silver; aluminum; gold. Without such metals, our computers would have very little to work with. Wood, plastic, and rubber are good insulators because they are non-conductive as far as regular electric activity goes. Water has many pieces of sediment that we cannot see with the naked eye. Do not test this fact with your own devices. It is possible for enough dirt on a device to act as a conductor when submerged in water. If you lost a device to water damage there are two solutions that may be able to bring it back from the dead. I have had success with both solutions, but there is no telling if you will. Recap: Pure water doesn't conduct electricity because water needs solutes (sediment/dirt/minerals) to create a path able to transfer the flow of electricity. Regular old water has a lot of solutes, which are usually harmless to consume and unnoticeable to the human eye, which can act as a platform for electric flow. More info on the subject: ;Physlink: Does Water Conduct Electricity? Definitely the best site I found for math students of all ages. Dr. Math, a section of The Math Forums, is nice because it has a link to various sections of its large collection, such as: Elementary School Math; Middle School Math; High School Math; College And Beyond Math. Another site that couldn't be better for teenage students. This site is packed with games, images, and animation, which will help you stay focused on the subject at hand: Math. A perfect resource for middle school and high school math. In addition to extensive content, there are a plethora of related games. This site is ideal for kids in elementary school, but can be useful for pre-K and middle schoolers. Many colorful and interactive activities. This site is a keeper. It has an average of 231.5 Topics per Grade (1st through Algebra - 8th/9th) and is growing as we speak, with the claim that a Trigonometry, Geometry, and more advanced sections are on the way! This site is different from Cool Math (#2). 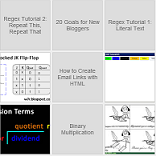 The site is full of content, majority being math games, but, there are math lessons as well. If you want to check if you factored something correct, this is your place. The internet let's nothing get in the way of your education. Helpful if you don't have a graphing calculator at the moment. 9. 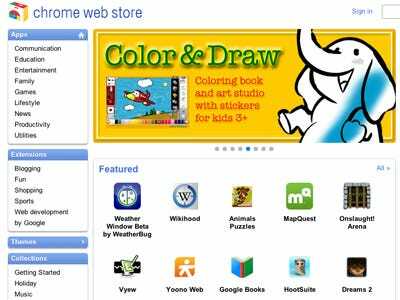 Chome Apps Search: "Math"
Nearly all Chrome apps are free, all you need to do is download Google Chrome Internet Browser, which is free as well. Have you ever played Snake? It's a very simple game where the goal is to direct your "snake" to the random point in the game field. When you run into the point or dot, your snake becomes longer by 1 unit, thus, making it more difficult to avoid hitting a wall (makes you lose) or running into your own snake (makes you lose). You can move up, down, left, or right and the goal is to make your snake as long as possible. Definitely a time consumer. When Youtube videos are buffering more of the video, you see a series of dots turning in a circle. That circle of dots will be your snake in one press of a key. Press [UP], [DOWN, [LEFT], or [RIGHT] key to begin your game of snake. Your video will resume like normal, but in the meantime you will have a game to play. What a brilliant idea! Might as well have some fun, as you wait for the video to continue! 2. press the refresh button next to your URL bar. 3. Right click the video and play around or browse the settings, such as, take speed test. 4. Last resort, try a different computer or reconnect to the internet. In Windows 7, like many other operating systems, there is a feature called the On-Screen Keyboard. The On-Screen Keyboard gives you access to all of the keys on the average keyboard with clicks of your mouse. This is extremely helpful; especially, if your laptop keyboard is not working properly. The average Laptop keyboard is hard to take out, because the parts in the laptop are so tight together and are built in the expectation that the computer will be dead by the time your keyboard stopped working, but things can happen. So, today, I will show you how to get to your On-Screen Keyboard in Windows 7 and how to create a shortcut for fast access to this nifty feature. You can use it along side your actual keyboard if only a few keys do not work. The program responds to the physical keyboard in addition to your clicks. The keyboard pops up in a new window and is at your command. To Set A Short Cut: Use my Simple Steps above to locate On-Screen Keyboard and instead of clicking the file (or program). Hover over it, right click, and then select [Copy] (Ctrl +C) and navigate to any location on your computer (desktop maybe?) right click > select [Paste] (Ctrl + V). If the short cut steps are not clear or are not working, you can right click the On-Screen Keyboard file and select [Pin To Start Menu] or [Pin to Task Bar]. If you do this, you will be able to access the program file if you press the Windows Key or click [Start]. If you want this feature to be on every time you log on to your computer (it will save you time) you can select [Options] key on the On-Screen Keyboard window (between [Fn] and [Help]) and click where it says [Control Whether The On Screen Keyboard StartsWhen I Log On.....] and check the box next to [Use On-Screen Keyboard]. However, the option will disable your keyboard function. Only check that box if your keyboard is completely broken and you do not wish to use it. You can deselect that option any time you want. Do you know what a byte is? It's simply and always 8 binary digits (bits). Binary Digit (bit): 1 or 0. As compared to a Decimal Digit: 0, 1, 2, 3, 4, 5, 6, 7, 8, 9. -Tom, would you like a byte of that pie? -Cmon, Tom, atleast have a nibble. ~Ok, fine Janet, I'll have a nibble at your damn pie. Tom didn't want a full byte, so he settled for half of a byte, A NIBBLE. That's literally the name it was given. I couldn't believe it when I heard this. It was too funny and unexpected. Goes to show that smart people have a sense of humor! USB 2.0 is 4 prongs, which, implies and points to the use of Nibbles for data transfer. Needless to say USB 3.0 is much faster than USB 2.0. Here are some example nibbles: 1011; 0100; 0000; 0110. Compared to bytes: 10110010; 10000000; 00000100. 5. Camera is good for video and pictures. 13. Touch screen able to distinguish multiple points of pressure at once. 3. No USB, SD and other common slots. 5. You will be dependent on your computer still. You are very limited in activity on iPad 2. 6. The ability to develop your own apps will cost you $100, even if you don't make any apps. 8. You are unable to view and edit files like a computer or PC Tablet can. 9. Too complex to be considered user friendly. Elders, and newcomers will feel overwhelmed. 10. All adapters and external devices must be purchased separately and will not be usable for anything but Apple products. 12. No kick-stand to prop the device up. 13. Poor and hefty writing tool when compared to PC Tablet. If you have an App from Google Chrome that you think deserves to be on this list, email me: w7rdotblogspot@gmail.com. I know that no one is perfect and I'm no exception, so please feel free to add to the list I created for you all. Here the link to the home page of the App "Store" (most of it is free): App Store Home Page where you can search for other educational or noneducational apps. 1. Nerds Have Power Chicks like power. With the right skills a computer dork has the world in the palm of his hand. People who hack might have an ego problem and rightfully so. If you knew you could tap into almost any organization or companies network and have access to all of their files and data. 3. Nerds Get Money Being smart is much more than standing up tall at graduation being admired by your parents; it also is your ticket to a job. And until one is on their own, they do not truly understand how important money is. And I would be lying if I didn't think a relationship is expensive at times, both ways around the table. 4. Nerds Are Mysterious The women will never know who is under the lab coat without an experiment of her own. 7. Nerds Are Funny The clumsy things nerds do is an add-on next to the interesting style of jokes they pursue. 8. Nerds Are Up To Date Like fashion, the internet is always changing. You don't want to fall behind do you? Your nerd will have you up to date on all the online trends you may have missed. 9. The Nerd To Cool Ratio is at an All Time High. Why not? 10. Many Nerds Can Gamble Like No Other Anything to do with numbers, is their forte. This was a surprise link to me tonight. Pretty crazy. Took place yesterday, August 4, 2011. Hacking is a sport for many, and you all should remember that the internet is not a place to trust with all of your important data or identity. No better way to understand hacking than to read the article created by hacker through the New York Times Network. Simple tip to help those that need to turn off "secure" browsing (https) to use specific applications on Facebook such as Tetris Battle. Click the [Account] drop down list and then select [Account Settings]. Then, navigate to the [Security] panel. Click, the "Edit" link to the left of where it says "secure browsing". Uncheck the box next to "Browse Facebook on A secure connection (https) wherever possible". Click "Change date and time..."
Many computers time and date data are synchronized with that of a site on the internet. To view that option and see if it is even on go to [Date and Time] (steps above) and navigate to the "Internet Time" panel. To change the way the time and date is displayed: [Start] > type "Change the way time is displayed" > select that file and the settings are at your command. First, you can make all the files invisible. They are still there, but you cannot access them without usingWindows Explorer (file navigation). Don't confuse Windows Explorer with Internet Explorer. In realistic terms, Windows Explorer is an offline, and local file navigation system; and that is what we are talking about here. [Right click] Your Desktop > Hover your mouse over where it says "View" > uncheck [Show All Icons]. [Right click] a folder or any icon > Select [Properties] > check the box next left of [Hidden]. There are a bunch of other ways to hide folders, but no other ways are as simple as these two are. Really create thinking here. Turning something so annoying into something pleasant and artistic. I placed 4 videos on here to show case this interesting Windows music that had me in awe. Tell me what you think via a post, email, Twitter, and Digg. w7rdotblogspot@gmail.com *These are not my songs. I found and organized them on my blog for your own convenience and entertainment. By the way, while I can I want to say sorry about the lack of posts last week (08/28 - 09/04) Hurricane Irene hit Maryland with enough bang to leave me powerless for six days: I had no electricity. I did a post or two at friends houses, but I could not do much more than take care of necessities like food, shower, and light. 1. Saving pages for offline use. To save a page for offline use in firefox all you need to do is: [right-click] a webpage; select [Save Page As...]; then, navigate to any spot of your choosing. Personally I would save the page to my Desktop. A saved webpage is essentially a frozen image of a website on your computer. The html code of the website is written into the new folder you saved. When you click the folder you created you will see the page, even when you are offline. Any updates to the webpage will not show on the "frozen" copy of the website. Even, easier than number 1, Bookmarking a page is a way to reach your favorite websites in one or two clicks. To bookmark a website: visit your favorite websites and on each click the star next to the URL bar on top of your Firefox browser. On this site it would be to the left of where it says "http://w7r.blogspot.com/..."
To create a search keyword for a site you search on right click the search bar or box of a web page and select [Add a keyword for this Search]. Name it what ever you like. It's your shortcut so maybe keep it simple like: "wik" for "wikipedia." The purpose of doing this is that you can save time searching by entering your "keyword + search term” in the URL bar. My Example for you: typing “wik + Frogs” will search wikipedia.org for pages about frogs. Do not forget to create the keywords before trying to use the feature. Saves you from having to waste your time typing in the sites URL and locating the search box. If you enjoyed this post, please email me and tell me so! Click here to email me. If you have been to the movies lately, you may have noticed that nearly half of the films are labeled as, "3D," or "Imax 3D." There's a chance that 3D has not caught on at the movie theater closest to you, but that doesn't mean you can't enjoy 3D at home. 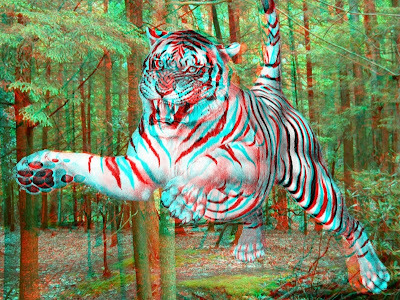 The 3D today is much different from the red-and-blue-glasses 3D we become tired of. Instead of utilizing the red and blue lenses to trick the brain into creating a sense of depth, often, people use the polarized system. In short, the polarized 3D system is used to eliminate the factor of color distortion, the blue and red in the old standard of 3D film and to allow people who can only see with one eye, or have a dominance of one eye, to see the 3D images just like everyone else. Power house: Electrical or electronic? Electronic is used to describe... cell phones, toys for kids, iphones, a circuit building kit, radio, watches, a kindle, small speakers, pacemakers, electronic toothbrush, iPad, Samsung Galaxy. Electrical is used to describe... lights in your home, a amplifier for your guitar, car battery, desktop computer, John Deer lawn mower, air conditioning, power lines. The Electronic objects are relatively small in size when compared to the world of objects powered by electricity. While, the Electrical objects are relatively big in size. The mistake is so common it is accepted, because these definitions are not always as well held up as they should be. Could you imagine if your English (or any language) teacher took points off of your research paper because you wrote, "I felt bad when the girl dropped her electrical cell phone." That is a bad sentence for more reasons, but her cell phone is not electrical. It is electronic! In addition to the girl's cell phone being electronic, it is also, electric. Electric describes general objects that use electricity, regardless of size. Check it out! Want Free Apple-Like Apps for Your Computer? You can get various apple like apps for free using Chrome Apps, provided by Google Chrome (Internet browser*). If you are viewing this page with Google Chrome, then your ready to go. If not click here and download Google Chrome. Google Chrome will provide you with tons of free features that will make your internet experience more enjoyable. AND... categories such as: family, books, business, favorites, health, electronics, simulations, music, cooking, fitness, sports, ect. I do plan to expand on this list, but it would take forever to list out all the great content provided by Chrome Apps. The best part is that ALMOST ALL OF THEM ARE COMPLETELY FREE. No need to buy an iPod Touch if Chrome Apps, satisfies your App cravings. The Kindle is an electronic reading device, Amazons most successful product to date, that has turned large amounts of non-tech savvy people into avid experimentalists in the digital world. There are different types of Kindles that have important differences, but you can be assured that they all will make your reading experience better than ever. If having internet access all the time sounds like a sweet idea to you, then purchase a Kindle that is advertised with, "Free 3G." I have a Kindle with 3G and during a power outage it is a plus to be able to browser ("surf") the web. So, if you enjoy reading articles and blogs, you will have an endless supply of reading content wherever you go. To be completely honest, the Kindle screen does not hurt my eyes at all. The pages on the Kindle feel exactly to that of book. The screen is dim, but effective, in which the Kindle comes with a light in it's case. There is NO GLARE. I personally, like choices, and complexity in my electronic products, but the average person would probably rather a simple product like the Kindle. You buy books right off the Kindle via the internet (3G or Wi-Fi). A Kindle takes a long time to charge because it's battery is meant to last ten whole days. That's plenty longer than any laptop battery life by far. Battery life can vary depending on activity, usage, and whether the wireless connection is enabled. 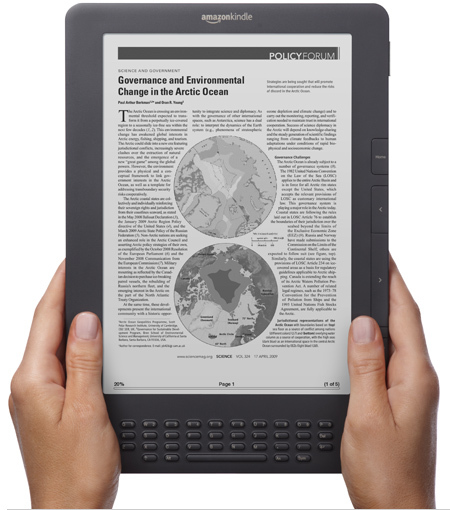 The Kindle can read the ebooks out load, line by line, among other comprehensive features to sharpen it's captivating effect. The Kindle can store approximately 3,500 books of average length in it's memory. Even if you read, or downloaded one book a day, you wouldn't max-out your Kindle's space for about ten whole years.